In a move some are calling an “about-face,” Governor Mike Pence sent a letter to the U.S. Department of Education Thursday requesting more information about federal dollars for a statewide pre-k program. In 2014, Pence stopped the Indiana Department of Education from applying for an $80 million grant that would have established a similar system. In the letter, Pence asks for more information about a preschool funding program through the federal government created under the new Every Student Succeeds Act. He asks to be notified when the application is open. 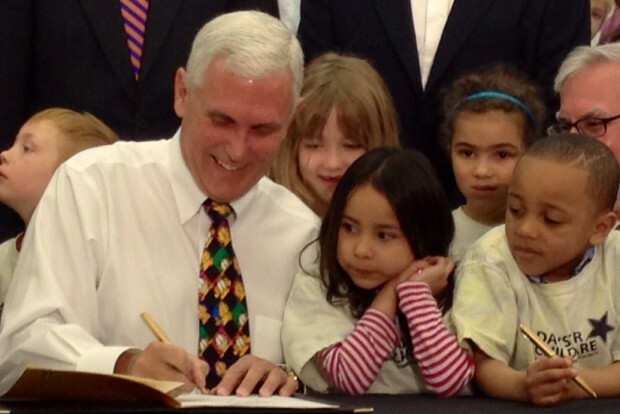 “I am committed to opening the doors of opportunity to the most vulnerable children in our state,” Pence wrote in the letter. The move comes after Pence’s last-minute 2014 decision by not to pursue the $80 million from the federal Preschool Development Grants program. “Our children deserve better,” she added. Indiana was one of 16 states eligible for that money in 2014. His reason back then for not applying was he wanted the state’s recently launched pre-k pilot program to succeed before expanding it. Andy Downs, director of the Mike Downs Center for Indiana Politics, says the letter could be a way to get positive press on this subject during an election year. “What this does is help deblunt the fact that he turns down free money that is available to help fund programs in the state,” said Downs. John Zody, Chairman of the Indiana Democratic Party, blasted the letter from Pence in a statement. “Expanding early childhood education for disadvantaged children should not be a partisan issue,” said Lloyd, in a statement.